The first part of this book is the memoir of an 18th-century Korean princess, describingn the cloisered but eventful life of the Korean royal family, incorporating a modern and postmodern commentary on it.. The second part describes, in minute detail, how Dr Babs Halliwell travels to and attends a run-or-the-mill academic conference in Seoul, Korea. On her journey she reads the account of the Korean princess, and in breaks in the conference she visits some of the scenes of her life. Until the events that cause the far-reaching effect, however, one might think Margaret Drabble‘s main purpose in writing was to record the early-21st century academic conference experience for posterity, perhaps as raw material for a furtire historian of academic conferences. I’ve attended enough academic courses and conferences to find it familiar territory, very familiar territory, even though most of the ones I’ve attended have not been held in such posh hotels. As I read, I kept having flashbacks to this or that incident at this or that conference. And most of the academic conferences I’ve attended have had no effect at all.The participants exchange e-mail addresses, and promise to keep in touch, but almost never do. Some of the papers may be published, and may appear on the Internet in one form or another, and probably have more effect there than being read at the conference, as the book notes. Avebury is a fascinating site that connects to other prominent features in the ancient landscape. 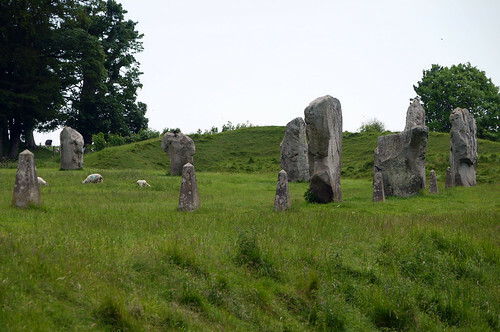 What remains of the Avebury Circles is largely reconstructed. In the 1930s Alexander Keiller having purchased the site of Avebury and part of West Kennet Avenue started to excavate the site and in time restore the site to some of its former glory. Where stones had been removed he placed concrete plinths to mark their former position. The outbreak of WWII put a stop to the excavations and restoration. Sadly the excavations have never been resumed. via Cherie’s Place » Avebury. Thanks to Cherie for a fascinating description and some beautiful photos. One of the reasons that I found it so interesting was that I first learnt about Avebury in a series of stories about moles — my review of the first book in the series follows below. The moles had a religion connected with stones and silence, and so Avebury, with its standing stones, was a kind of holy place for them. The moles also had special ceremonies on longest night and shortest night, and so it seemed appropriate that last night (or is it tonight?) was the longest night here, and the shortest night at Avebury. The series of mole books unfortunately seemed to deteriorate as it went on. I got the impression that the author wrote the first one because he enjoyed it, and the others because he was under pressure from his publishers to produce sequels. The second and third books weren’t too bad, though not up to the standard of the first, while the last three in the series were dreck. But anywau, many thanks to Cherie for posting the information and the pictures at such an appropriate time. On reading this for the first time, it seemed to have been inspired by the popularity of Watership Down by Richard Adams. What Adams did for rabbits, Horwood does for moles. The system of mole tunnels under Duncton Wood is large, and moles in one part hardly know those from other parts of the system. There also some parts of the system that are almost forgotten, and there are also some customs that have been forgotten as well, so that the moles are using their centre, the silence of the Stone at the centre of the system. This enables a cruel tyrant, Mandrake, to take over the system. Two young mioles, Bracken and Rebecca, the latter Mandrake’s daughter, meet, and eventually embark on a liberation struggle. The moles are given a philosophy and a mythology that is very human, and yet it somehow does not seem to diminish their moleness. This is a book I haven’t read yet, but it looks very interesting. Why did Kennedy die? He died because he was turning towards peace. That can be established. It’s in all kinds of documents, and I’ve cited hundreds of them, and there are tens of thousands behind the hundreds I’ve cited. He turned toward peace, so that’s the reason why he’s assassinated. What if he had not turned toward peace? Of course, he wouldn’t have been assassinated because that’s the critical issue right there. If he had not turned toward peace, if he had not, in the middle of the Cuban Missile Crisis, turned toward his enemy, Nikita Khrushchev, and said, I need your help, and had Khrushchev, for that matter, had not turned toward his enemy and said, yes, now we need to let Kennedy know that we want to help him – he said that to Gromyko, who was standing beside him, his foreign minister. Had that not happened, you and I wouldn’t be talking about this right now, nor would anyone else be doing much talking. We’d be in a nuclear wasteland. That is hopeful. Had John F. Kennedy not gone up against the Powers That Be in the midst of the Cuban Missile Crisis and turned with his enemy towards peace, there would be no hope for anything right now. That is hopeful. That is certainly different from the impression that I got at the time. At the time of the Cuban Missile Crisis, it seemed that Kennedy was the warmonger, prepared to have a nuclear war because he didn’t like the idea of Soviet missiles in Cuba, close to the USA, but being unwilling to remove American missiles from Turkey, on the border of the USSR. Over the last 10 years or so Scandinavian crime fiction has come to dominate the genre in the English-speaking world. Many of the books in the genre have a gloomy boozy divorced (or about to be) detective as protagonist. This one is different. There is no protagonist. We are given glimpses into the lives and loves and hates of members of different branches of the Swedish police as they are touched in some way by the apparent suicide of an American journalist who fell from the 16th floor of a student residence. The book is not well-written; in many ways there seems to be too much irrelevant detail. Describing in detail how a single protagonist spends Christmas is one thing; doing it for five or six different characters seems to be overdoing it. Some of the problems in the writing may be problems in translation rather than in the original. The writing sometimes seems stilted. One of the more disconcerting things is that it takes one a while to work out the period the story is set in. The book was first published in 2002, so one expects it to be at around the turn of the century, but the technology doesn’t fit — there are no personal computers, only typewriters. No cell phones. The technology used would seem to date it to about the mid-1970s, but the story also concerns the investigation of a possible plot to assassinate the Swedish prime minister, which links it to the assassination of prime minister Olof Palme in 1986. Though the prime minister in the book is not named, there are sufficient resemblances in the story to make that a possible period as well. One of the minor characters is a South African student with an improbable name, and there were stories of South African connections to the assassination of Olof Palme, and in Totale aanslag by De Wet Potgieter this is presented as historical fact. As an aside (this is not mentioned in the story, and is rather a personal anecdote), in 1988 my wife worked in a factory and the office next door to hers was used by a company that was indirectly linked. Sometimes she could not help overhearding conversations in the next door office, and she got the impression that they were involved in some shady business — money laundering, illicit diamond buying, or something like that, and possibly the assassination of the Swedish prime minister. At about that time we had a break-in at our house, and the house was thoroughly ransacked, cupboards and boxes were emptied, but the only things that were taken were the cheap loudspeakers for our radiogram, which had been carefully unscrewed from their cabinets (the cabinets themselves were left behind), and some food. We had the impression that the thieves were looking for something very specific, which they didn’t find, and the usual things that thieves took, cameras, computers etc., were left behind. But, to get back to the book, in spite of its deficiencies, it was an interesting story, even if it was not well-told, and ultimately worth reading. Yesterday, while on holiday in Pietermaritzburg, we visited old friends Colin and Mary Gardner, whom we had not seen for a long time, and one of the things we talked about was a proposal by Paul Trewhela for a new history of the Liberal Party of South Africa, and also Paul Trewhela’s notion that the Liberal Party ought to have gone underground in 1968, instead of disbanding when the Improper Interference Act became law. I’ve blogged about Paul Trewhela’s proposals before, so I won’t repeat everything that I said there, but Colin Gardner came up with a new slant on it. He was a member of the national executive of the Liberal Party at the time the decision was made to disband, and he said that they had considered ignoring the Improper Interference Act (which prohibited multiracial political parties) and just carry on as if nothing had happened, and decided not to. One of the reasons for that, that I had not been aware of, was that some Liberal lawyers, who were in touch with some National Party lawyers, said that that was what the government was expecting, and if it happened, they would declare the Liberal Party a “white” party, and prosecute the black members for contravening the Improper Interference Act. Basing political decisions on what was, in effect, idle gossip over tea at a Law Society meeting, or something similar, may seems strange, but that was one way of gaining intelligence of the intentions of the government. And as for Paul Trewhela’s idea, which he still seems to be pushing, that the Liberal Party ought to have, or even could have, gone underground, it would have been impossible, for reasons I have already noted (Notes from underground: A liberal underground in South Africa), namely that, having operated openly and publicly for 15 years, all active Liberals were known to the SB (Security Police), and any such activity would have been reported to them immediately by their izimpimpi. Colin Gardner also remarked that one of the things that followed the passing of the Improper Interference Act, though not necessarily caused by it, was the rise of Black Consciousness. At first the National Party government welcomed BC, because they saw it as their policies bearing fruit, but it didn’t take them long to realise that it was independent of their control, and not at all what they had in mind by “own affairs”. Steve Biko’s declaration of himself as a “non-nonracialist” could initially be mistaken for what the National Party government had in mind when it passed the Improper Interference Act, but eventually they learned that it wasn’t. Colin also thought that Steve Biko was using “non-nonracialism” as a tactic, and would, if he had lived, become nonracialist, though whether he or his ideals would have survived in the current South African political climate might be questionable. Steve Biko didn’t have a good word for what he called “white liberals” (which continues to be a swear word in South Africa), but I suspect that what he had in mind when he used the term “liberal” was Nusas (the National Union of South African Students), rather than the Liberal Party. And, as have pointed out in Notes from underground: A new history of the Liberal Party?, the word “liberal” is still misused, and still misunderstood, as much as, if not more than, it was 45-50 years ago. It’s about bureaucratic machinations in a conspiracy to stop one sick old lady from receiving communion.